Like most leagues, the NDCXL uses timing chips to make it faster and easier to work out who finished in what position. You can even see your lap times and compare yourself to your nearest rivals! Please remember to return your timing chip after the event! (especially as the league has to pay for missing chips). 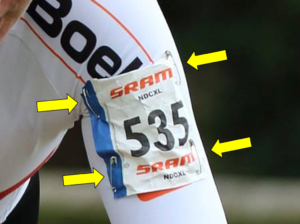 You pin one number to your back and one to your arm that can be seen by the judges at the finish line. Think about your position on the bike … when you’re forward on the bars you don’t want extra strain on your jersey. Not too far around the front of the arm or the judges won’t be able to see it. Remember you are approaching them in a bunch at incredible speed. Please use four pins, one in each corner. That’s 4. Not 2. Arm numbers are just as important as back numbers and vital when the back number is covered in mud! 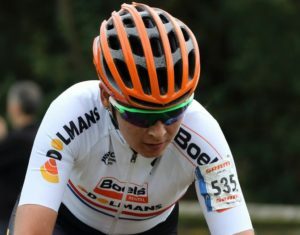 Again, think of your position on the bike … the number needs to be comfortable when you’re forward on the bars, and not so tight that it pops the pins or tears your jersey. Pin low down so that the number is easily visible – not obscured by your flowing hair, a hood, etc. Use four pins, one in each corner. Some add extra pins each side for extra security.